Who is Soni Sori ? Soni Sori is the aunt of Lingaram Kodopi, a young journalist who was arrested on September 9th 2011, on charges of collecting money for the Maoists. Her three young children, aged 6, 10 and 12 years, are now in the care of her brother, Ramdev, since her husband has been imprisoned in Chhattisgarh on false charges. Sori fled the state fearing for her life and reached New Delhi seeking legal assistance. She was arrested on October 4th by the Delhi police acting under the directions of the Chhattisgarh police. The police allege that Sori is involved as a conduit for money transfer to the Maoists from the Essar group; a charge openly denied by Essar. She has also been falsely charged under several other cases of aiding the Maoists. An examination of publicly available materials demonstrates that the charges against both Sori and Kodopi are false and politically motivated. 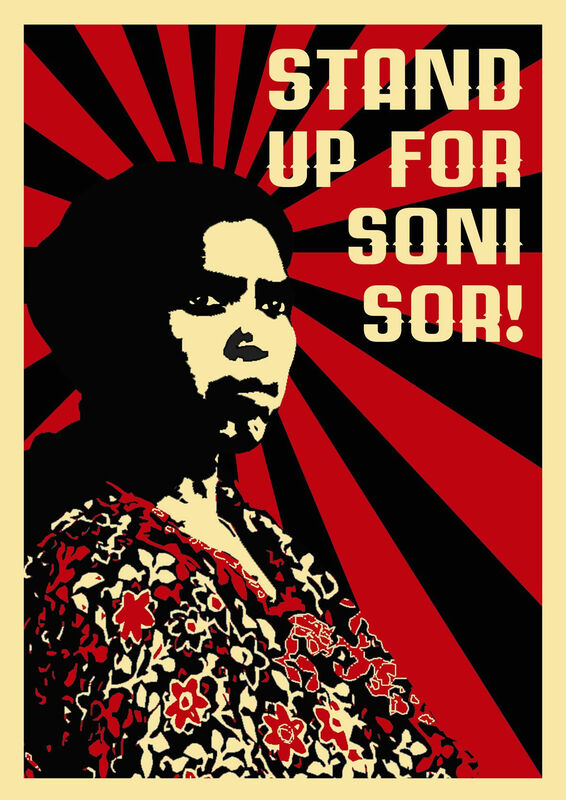 In response to petitions filed in courts in Delhi, a judge ordered the Chhattisgarh police on October 7th 2011 to take all measures to ensure Soni Sori’s safety in transit. But subsequently, it was evident from the medical examinations that police have brutally tortured her in custody, say rights’ activists. The Chhattisgarh police took her to hospitals in Jagdalpur and Raipur later in the week. Remarkably, the medical reports from these hospitals failed to confirm even the observations reported by the doctors in Dantewada. It was in response to this sequence of events that activists and lawyers filed a petition in the Supreme Court of India demanding an independent medical examination, outside the control of the Chhattisgarh police. The Government of Chhattisgarh has denied that Sori had been tortured, but the Supreme Court granted the petition on grounds that “the injuries sustained by [Soni Sori] do not prima facie appear to be as simple as has been made out to be by the Chhattisgarh police. According to rights’ activists, The Chhattisgarh police has a long record of committing human rights abuses and atrocities outside and inside prisons, well documented by human rights organizations in India, including PUCL and PUDR as well as Amnesty International and Human Rights Watch. Even though, The Indian Supreme Court has also strongly condemned the abuses committed by the police and the vigilante forces organized, armed and funded by the state and national governments, the Government of Chhattisgarh, with the support of the Government of India, has repeatedly failed to honor the orders of the Supreme Court of India, activists allege.